The August NAHB/Wells Fargo Housing Market Index rose to a five year high of 37. All three components of the index also increased to five or more year highs. Builders report continued greater home buyer interest in purchasing a new home while interest rates remain low, house price movements appear to have turned positive and builders offer competitive prices. The expectation component of the index increased to 44, the highest since March 2007 when it was at 50, a level where equal number of builders foresee a good market as see a poor market. At its depth in January 2009, the expectation component was 6 and was in single digits for five straight months during that history-making trough in home building. 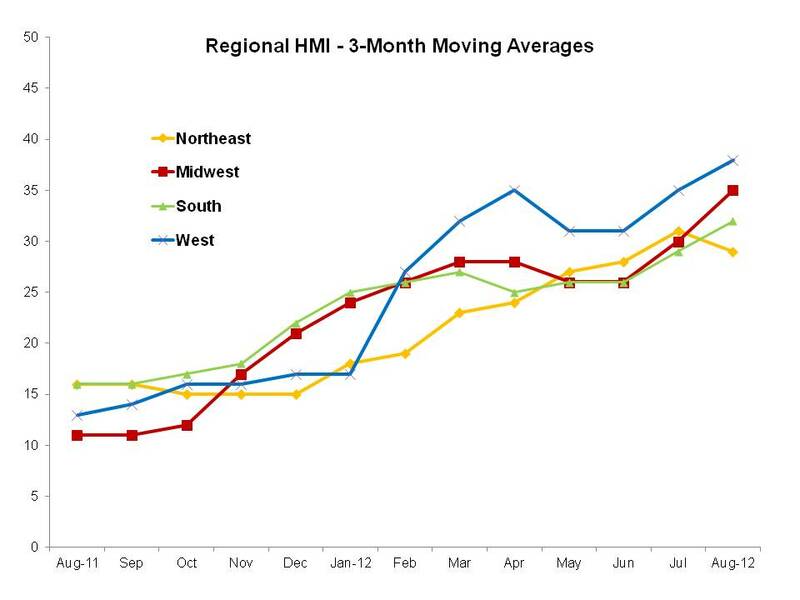 This month, NAHB also introduced a three-month moving average series for the four regional Housing Market Indexes. The monthly indexes will continue but because the regional sample size can be smaller, especially for the Northeast and West, a longer term look at these sub-indexes may provide additional understanding of what is happening. In that regard, the smoothing does show a more consistent trend in each region, which may be a more reliable indicator of regional sentiment than the saw-toothed monthly numbers.